The wind ruffles the leaves, making a gentle rustle that seems to echo my breath. It’s a sound so gentle it is no sound, or else it’s the sound of the sea, of the blood, of life in its inexhaustible rush from birth to grave. Ashes to ashes, leaf to earth to soil to feed the roots to swell the buds to form leaves again to capture the sun. Everything is a cycle, endlessly spinning: the earth in its orbit, the sun whirling through the galaxy, one continuous dance flowing farther and farther out from its heart and never ever finding rest. 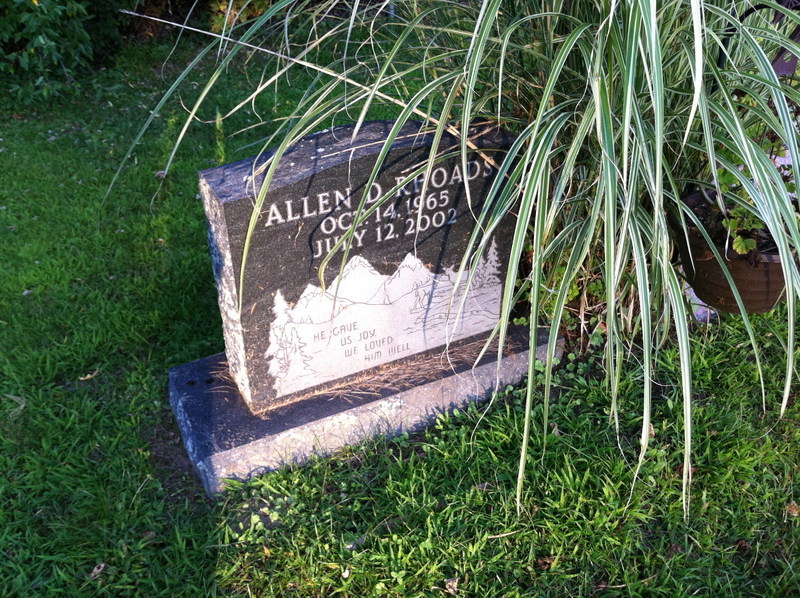 My brother is buried here. The wind whispers through the variegated grass that has grown high in front of the stone, obscuring words I no longer need to see to feel them stabbing into my heart, a long thin prick like a knitting needle, jabbing again and again so deep that I don’t feel the path of the pain, only its terminus, the point from which it radiates out into my limbs like a heart attack, like a stoppage of breath when you choke on something that cannot be swallowed and cannot be coughed out, which much lodge inside until you die of it. I do not want him to be dead. My daughter tells me, in a sweet plantive voice, that she wishes she knew him. She wishes he had not chosen to drink himself to death before she was implored from the oblivion that exists before birth to come and help me heal the pain in my heart. I wish she had known him, too. She sometimes refuses to come to this graveyard with me any more. Once she came here and gaily chased rabbits, streaks of silence through the dancing grass. Now she knows it makes me sad like nowhere else in the world. Here lies my brother, my grandmother, the only grandfather I ever knew, and the grandmother who helped raise me, alongside her husband, who was dead before my parents conceived me. And a cousin, killed in a car accident before her first birthday, though not before mine. Many hopes lie buried here. This entry was posted in Cemetery essay, Death's Garden Revisited and tagged Bendle Cemetery, children's grave, family graves, Michigan cemetery. Bookmark the permalink. Peace to you, Loren. This was beautiful and painful, many hopes indeed. Thank you Loren for a touching article on the loss of your brother and other family members. I know that there are no words that will take this pain away. But you have put out your sorrow to the world to honor and memorialize your brother. Thanks for sharing. Take care. Lovely tribute in remembrance of your brother. Let truth and beauty weave its magic round his ways and time, the robber, leave him, the boy’s heart all his days. It is different when we visit a cemetery where some of our loved ones are buried, isn’t it? Your brother must have been a special person for you to miss him so much. He is remembered in your fine tribute to him. Peace to you. May good memories of him ease your ache.